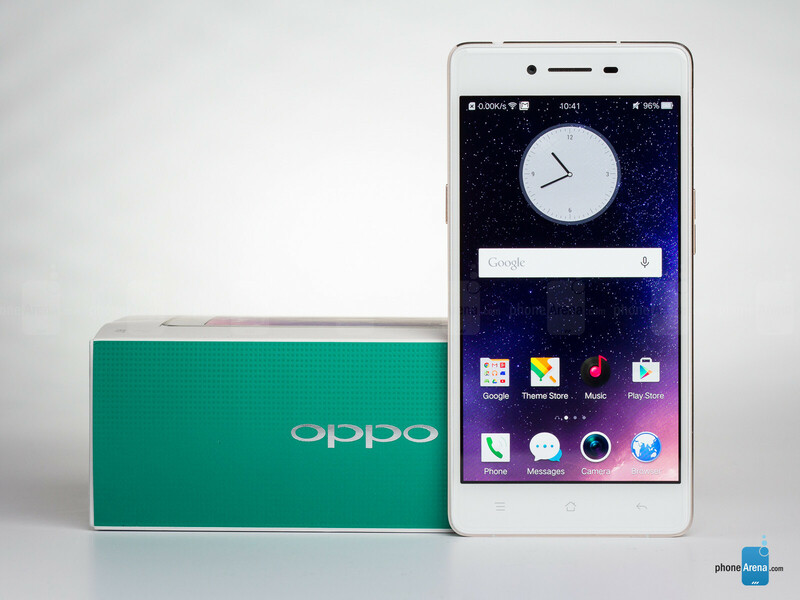 Chinese smartphone maker Oppo has turned in a new addition to its R-series of mid-range smartphones - the Oppo R7. It enters our world just 7 months after the Oppo R5, which we remember mostly for its extraordinarily thin, 0.19-inch (4.85mm) frame. But the Oppo R7 is born with a different mission. While the R5 is a statement of engineering voodoo and a Guinness World Record showcase, the R7 is built with more mundane, but no less ambitious goals behind it. The R7 wants to be a universal crowd pleaser at a competitive price point. To achieve this, Oppo stuffed it with as many attractive design, technology, and user experience traits as a $400 smartphone could possibly take. Then took it to war with the likes of Samsung's Galaxy A series and Huawei's Honor handsets. Beyond doubt, Oppo has pointed its sights up high in the sky, but how close to the center target did it actually hit? This is what our review will establish! 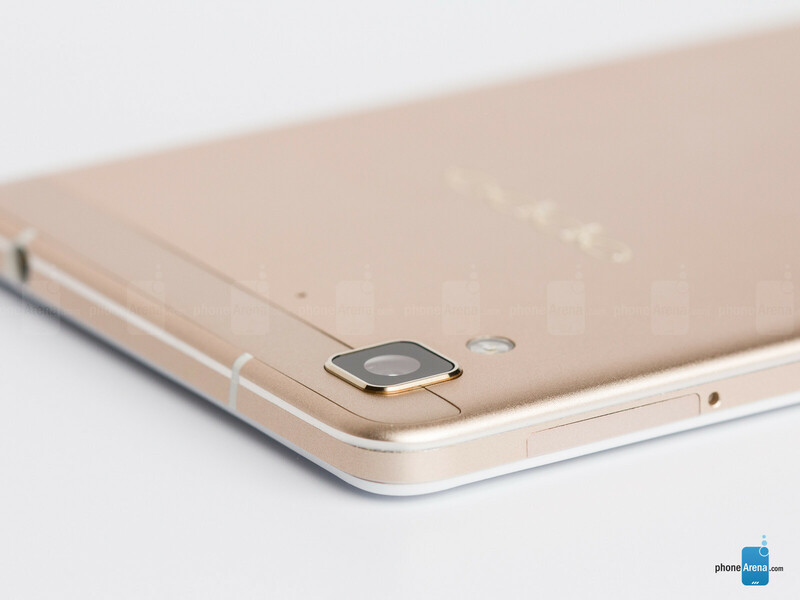 Oppo closely approximates the traits of high-end design. 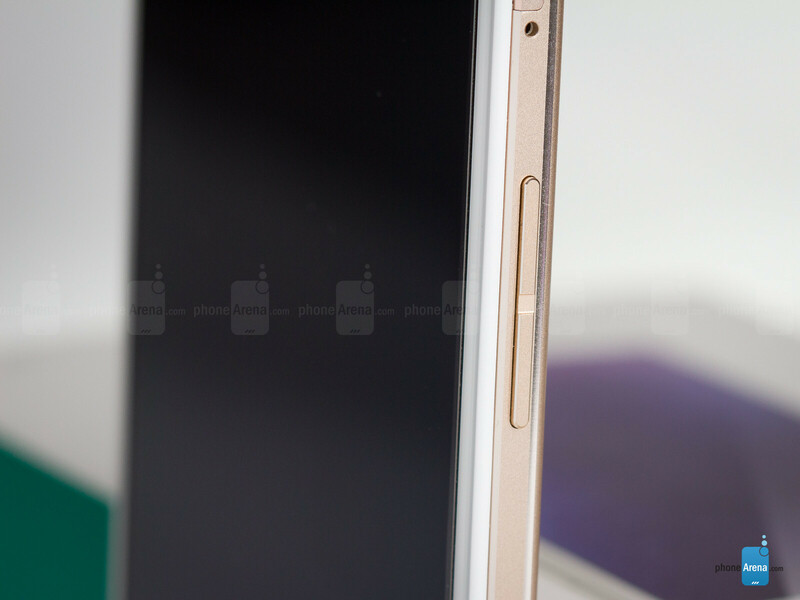 For one reason or another, Oppo's mid-ranger is sold in gold and silver finishes only – no black model, which is a shame. When it comes to stunning good looks, though, the Oppo R7 isn't looking towards anything less than Apple's iPhone 6 and HTC's One M9 to compete with. You may be puzzled with this statement, considering this is a $400 smartphone we're talking about. But upon taking the R7 out of the box and giving it a first glance, we felt naturally compelled to reach for the iPhone 6 & One M9, two shining examples of obsessively high smartphone design standards, and check whether our strong initial impression actually holds up in reality. Truth be told, it mostly does! 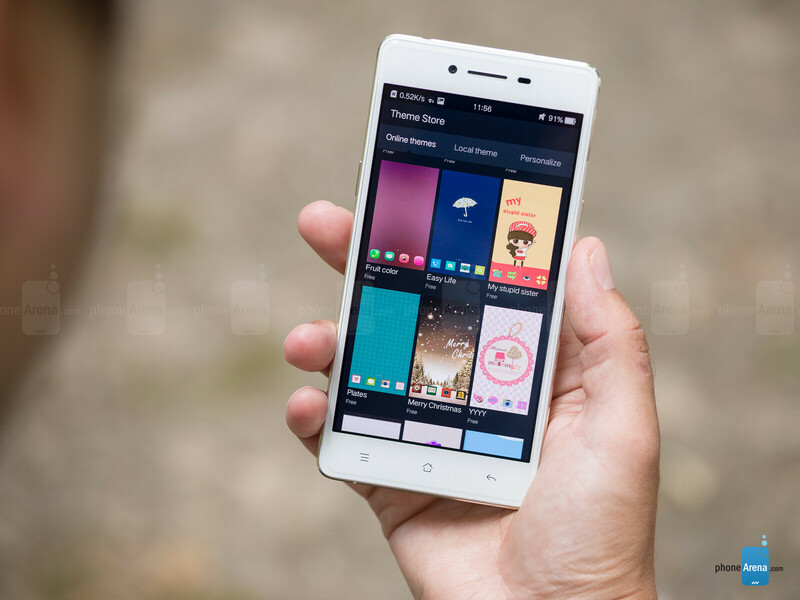 The Oppo R7's design and build quality are a very close approximation, and a flattering imitation of the aforementioned flagships' best traits. Up front, the rectangular R7 greets you with a 2.5D "Arc Edge" laminated screen that looks as if it's painted on the plastic front panel. Said panel is adorned by the front cam, earpiece, and a combined light & proximity sensor on top, while the bottom houses capacitive Android navigation keys. The R7's sides and back panel are all machined aluminum that's allegedly being put through 48 polishing processes prior to shipping. This is a unibody design, but rather than keeping the sides completely clean like HTC, or rounding them out like Apple, Oppo embellished them with two polished matte strips and kept the lines straight, sweeping the corners to prevent that uncomfortable "rectangular slab" feel in hand. The back panel, however, is entirely flat, and definitely doesn't feel as comfy as a curved panel does. All is fine and well thus far, but as the old saying goes, the devil is in the details! The power and volume keys (positioned to the left and right, respectively) are a little wobbly and perhaps a tad thinner than needed. But still, these flaws do not compromise the overall experience, and the buttons' tactile feedback feels pretty good. 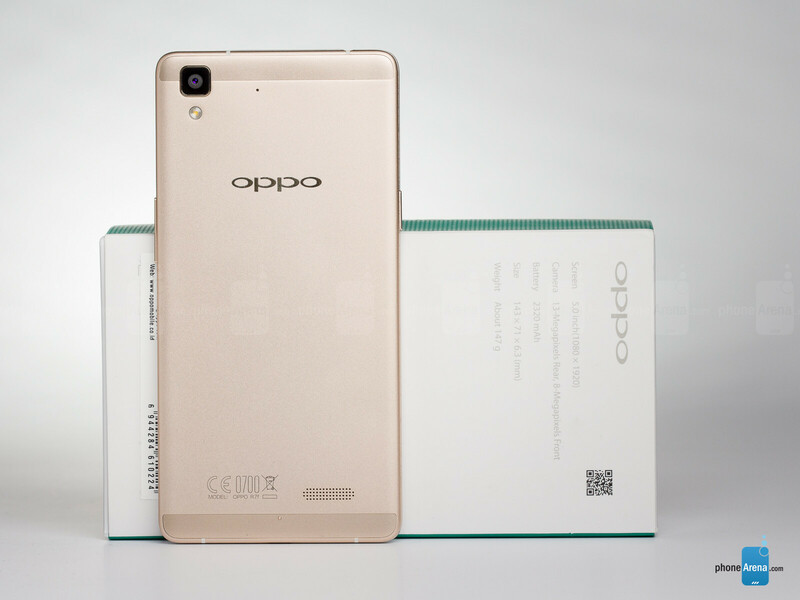 Measuring 5.63 x 2.80 x 0.25 inches (143 x 71 x 6.3 mm) at a weight of 5.19 oz (147 g), the Oppo R7 is pretty tall, but reasonably wide and pleasantly slim. Its weight gives it a good heft, without being overbearing or exceeding the average weight of a solidly built phone with a sizeable display. 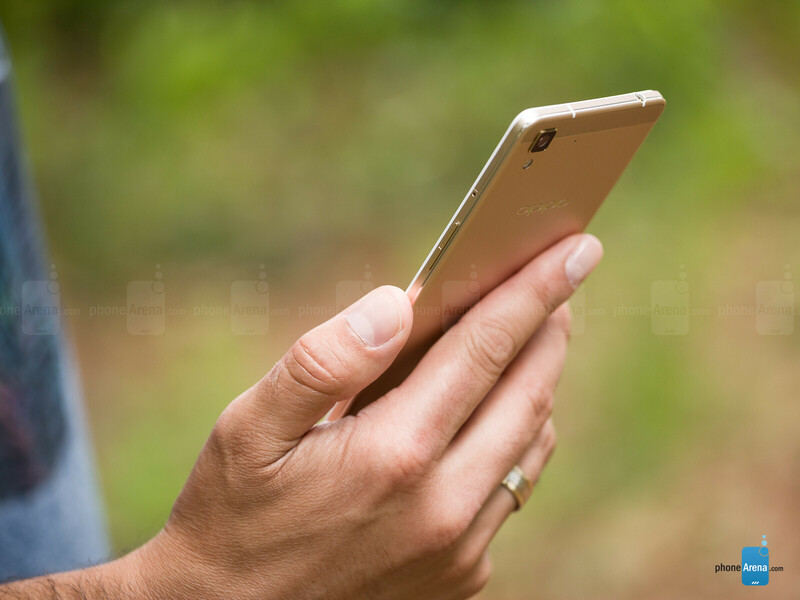 In fact, the Oppo R7 is among the most reasonably sized metal smartphones you can buy today. 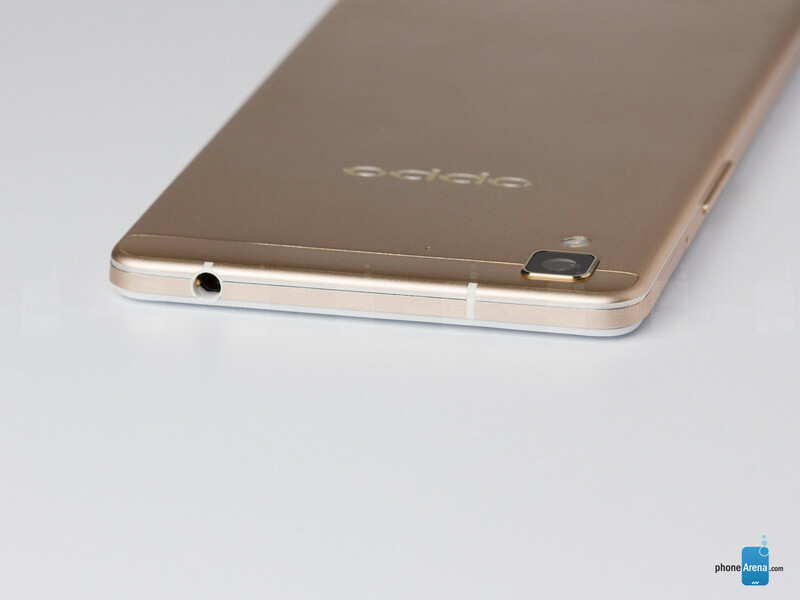 The Oppo R7's dual-SIM slot is positioned on its right side and gets unlocked with a metal pin. It can carry either two SIM cards (1 x microSIM, 1 x nanoSIM) simultaneously, or one microSIM card and a microSD card simultaneously. Thus, you have to choose between dual-SIM connectivity and the ability to expand your storage - you can't have both at the same time. Other than the SIM/SD slot and control buttons, the R7's sides have the 3.5mm headphone jack at the top and the microUSB port at the bottom, while the mono speaker is positioned on the back panel. 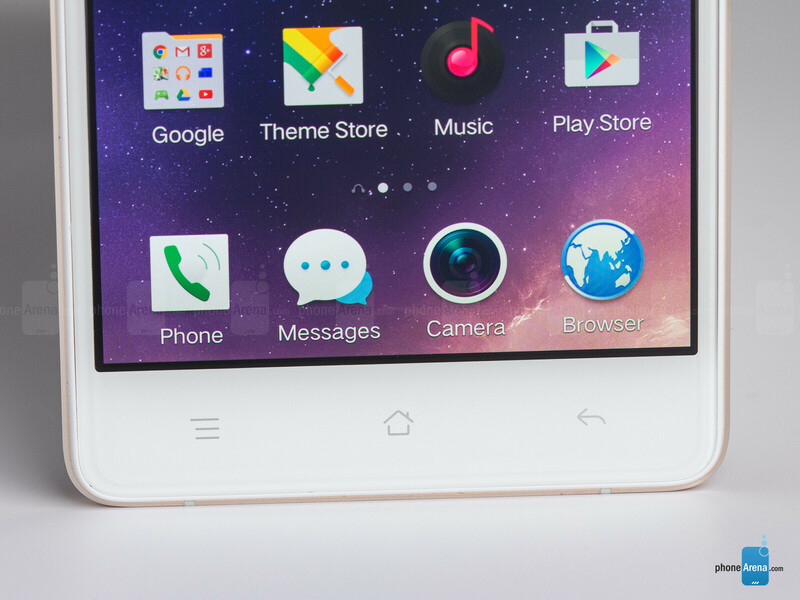 With the Oppo R7, lovers of premium smarphone design won't find themselves missing out on any substantial look & feel benefits that used to be exclusive to smartphones priced north of $600 not long ago. However, high-end market saturation and extreme competition are pushing vendors into bringing mid-range devices' design and performance standards much closer to flagship territory than they've ever been. The Oppo R7 is a glowing example of this trend, which is also exemplified by Samsung's A-series handsets and Huawei's Honor line. Sharp visuals and punchy colors are to be had here, but taking a look at the test measurements reveals the screen's flaws. The Oppo R7 is equipped with a 5-inch 1080x1920 AMOLED panel that racks up a pixel density of 441ppi. At first glance, the screen is definitely a looker with its sharp visuals and punchy colors, but taking a look at our test measurements reveals that it isn't exactly flawless. At least you won't have to worry about scratching it, as the pre-applied screen protector does a good job guarding it. First off, the panel achieves a very good minimum brightness level (3 nits), making it great for bedtime viewing, but having only 292 nits of maximum brightness at disposal is decidedly poor. This makes the Oppo R7's screen difficult, though not impossible to discern under bright sunlight. Moreover, the color temperature stands at 8162 Kelvins, which is definitely on the colder side of Colorsville. The resulting bluish tint you'll notice isn't distracting, but is there, and paired with the subdued red hues, it becomes quite evident that the R7's display is more about beautiful lies than practical realism. The average gamma value of 2.14 adds to that impression. The various darker shades and the majority of lighter shades in the Oppo R7's on-screen image are represented mostly right, with a mild contrast boost from halfway across the spectrum making lighter shades appear a bit lighter than than they really are. Thus, the display appears slightly more contrasty. As for color balance, our test results show that the green and cyan shades, in particular, are rather overblown. The white point drifts into blue, red is under-represented, and green is far from the reference values. This doesn't sound very reassuring, but for the most part, the Oppo R7's screen flatters the eye with its tastefully boosted contrast and tolerable color balance. The image isn't washed out or overly contrasting, and the annoying “sickly green” hue of older generation AMOLED screens is non-existent. In fact, most of the times, we'd prefer a panel that's a little colder, like the Oppo R7's, to one that looks like green goo. Being an AMOLED screen, the one on the Oppo R7 does exhibit a fair bit of brightness and color distortion when viewed at a 45-degree angle, but the panel still holds up well compared to the average IPS LCD screen. You can trust the Oppo R7's screen to remain clear and visible under all but the most extreme viewing angles. As a whole, we feel safe in assuming that all but the most demanding smartphone users out there will be pleased with the Oppo R7's screen. However, its subdued maximum brightness output is definitely something to consider before buying, as you might end up disappointed in the screen's performance outdoors. It's also not a display for color purists, but rather one for lovers of vibrant hues. Seems about fair given the dim display and mediocre battery life. The cool thing here is the number of options available at that mid range price point has really upped how competitive that space will have to be. The downward pressure on pricing for Android phones is the exact reason that nearly the entirety of Android manufacturers are barely making any money. The reason is really simple. If I can sell a device for $600, you have to sell two at $300 in order to make the same kind of money, But in reality, it'd be closer to 3 due to your actual margins on each device. That isn't realistic, and that's why prices are creeping up in because they realize they have no possible chance of making money on volume alone in the very near future with the market already being saturated. This desire to have everything sold at bare bones prices is inevitably going to kill off the cheap flagship concept, pretty much by necessity if these companies want to actually survive in the long run. I think at some point they are gonna start giving out smartphones for free and making dough on services. This or samsung a7? And people complain Samsung is overpriced?? The R7 Plus is what I want to see. But I guess this is a good mid range device. 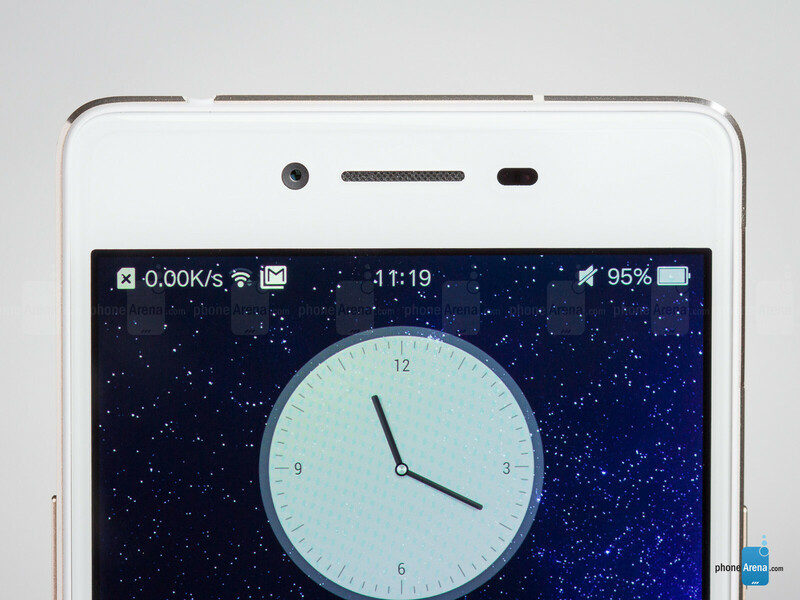 The Oppo R7 has fast charging function that charge for 5 minute, and make phone call for 2 hours. It is the same with Oukitel K6000 Pro smartphone, here is a test video on Youtube channel "GEEK LOVE".